07/10/2013 The 10th annual AD Russia conference was held on the 28th of August at the Metropol Hotel in Moscow. Konstantin Breze, Managing Director of Lesjöfors Russia, was presented with an award celebrating the 10 year relationship between AD Russia and Lesjöfors Group. The award, presented by AD Russia President, Gennady Korolkov, recognises Lesjöfors' role in strengthening the group's position in the Russian market over the past decade. Over 300 professionals attended the conference, representing many of the automotive market's most well-known suppliers. 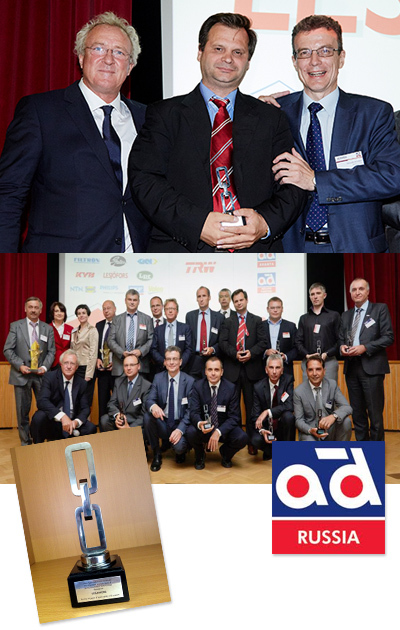 AD Russia (part of Autodistribution International) is a leading automotive distribution group, specialising in the wholesale supply of automotive components to the Russian market. Today, AD Russia operates 36 sales centres covering 27 Russian cities, and offers more than 200,000 parts to the Russian market.